February hit with a bang and delivered a real snowstorm. What a surprise! Guess I can’t relax and think spring is coming next week. I was feeling that way and really thought I might have flowers blooming in the garden by March 1st ! If this keeps up I don’t think so. But it will be short lived. I notice the sunshine is very warm and toasty when I’m out painting. And the sap is running early this year. Its tax time and I’m already in the thick of planning for summer. I try to postpone it a bit so I can really enjoy the quiet time of winter. As soon as the summer season ends (in November now, it keeps getting later every year) and things get quiet, I usually try to catch up on what I let slide during the hubbub of summer. I had a long narrow panel in my car that was perfect for a slice of rocks with surf hitting hard. The ledges in Cape Neddick are perfect for big surf. There is nothing like painting outdoors. Photo: Marcus Gale. In the past I always scheduled certain annual events on my calendar but now I see changes in the wind. 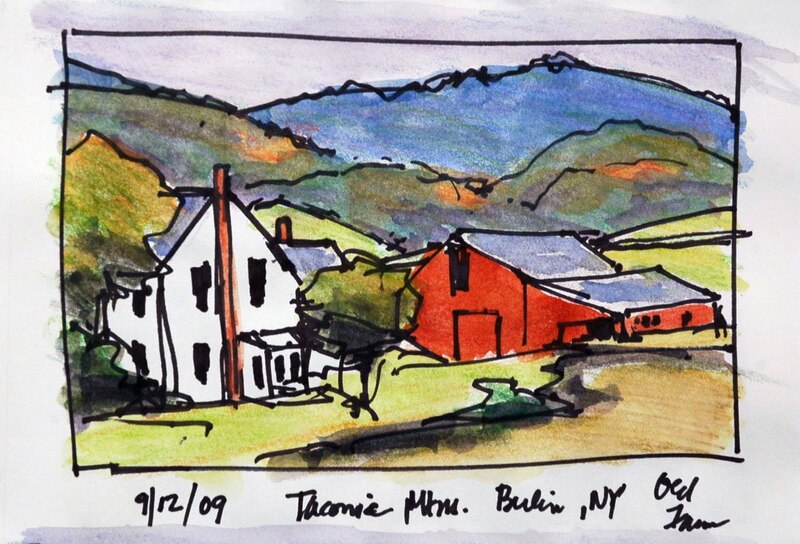 I used to travel and participate in a certain amount of regional & national plein air events and festivals. I loved seeing fellow painters, meeting new collectors, visiting and painting in new locations and catching up on news in the art world. A few years ago I started to get so busy here on the coast in the summer that I began trimming the number of events that I attended. Now it looks like I am trimming once again. I need to really be here in the middle of my high season, not traveling somewhere else. My husband was the first to mention that I really needed to stay home as there was an awful lot to attend to in my own back yard. I resisted for a bit until it was obvious that I should stay in Maine. 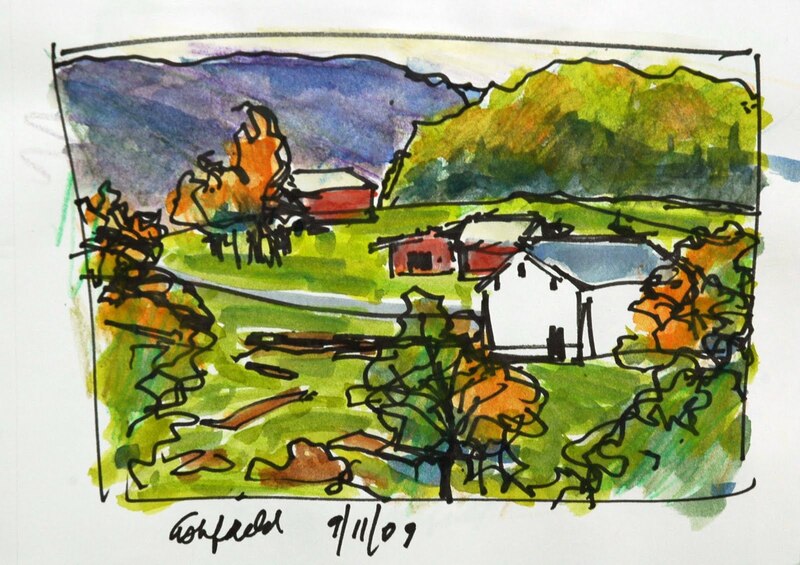 A new thing that I added to my calendar last year was plein air classes. I started teaching “en plein air” again last summer and realized there was a need for classes locally and regionally. I also happen to love teaching! I started with a fluid approach to the class structure and watched to see the results. In the fall I began teaching a studio class with a new method and structure I designed to help improve painting skills fast. It worked. As a result of the new method I will be teaching it outdoors this summer in a 5 week block of classes. I see that it really helps beginners get a solid handle on plein air painting and it helps experienced painters improve dramatically. It’s a tried and true method that I used for myself and its great to see how fast it works for others. I also teach in a variety of mediums, so I get to paint again in all these mediums that I love! I focus mostly on oils but when I have time you will find me painting in acrylics, watercolors and gouache. I like that John Singer Sargent and Andrew Wyeth painted in several mediums. I handle each one differently and I notice they influence how I paint. I’m very loose with watercolors as they are so fluid. The way each medium behaves makes me handle it differently. SIGN UP HERE FOR 5 WEEK SESSION. If you’d like to improve your painting skills before the warm weather arrives you can sign up now for the next session. Classes are small with lots of personal attention. Be prepared for a lot of painting and a lot of fun! If you would like to join this studio class please contact me. If you work with oils, watercolors, gouache or acrylics and want to gain some solid skills, comfort in your chosen medium and rapid improvement this is the class for you. There is one make up class every session for (sick/ice/snow days) if needed. Do you want to be a great painter? Come paint in Maine this summer. Give yourself the opportunity for your own breakthrough in a beautiful place by the sea that you will never forget. I am offering three Maine workshops this summer. 2015 MAINE LATE SPRING WORKSHOP// JUNE : “CAPTURING THE LIGHT ~ PLEIN AIR IN MAINE ” DATES: JUNE 8 -12 FOR: EXPERIENCED BEGINNER THRU INTERMEDIATE $300 ~ Class meets from 9am-12pm each day. All levels welcomed- beginner to professional. Late Spring in Maine is beautiful with every thing in bloom and long days with lingering light. This workshop starts with a solid introduction to the fundamentals of good painting and strategies for painting outdoors in all kinds of conditions. The workshop includes lectures, hand-outs, demonstrations, personal one-on-one instruction and painting on location in beautiful classic Maine coastal settings including lighthouses, surf, rocky coast, beaches, marshes, harbors and picturesque villages. I will demonstrate my painting technique and students get the opportunity to paint in a fun, high-energy, 5 day class. Students must provide all of their own art supplies, meals and transportation to and from painting sites. To register for these workshops and for an accommodation list please Contact me. 2015 MAINE SUMMER WORKSHOP// JULY : “CAPTURING THE LIGHT ~ PLEIN AIR IN MAINE ” DATES: JULY 27- 31 FOR: EXPERIENCED BEGINNER THRU INTERMEDIATE $300 ~ Class meets from 9am-12pm each day. All levels welcomed – beginner to professional. Mid Summer in Maine is glorious with warm days and cool nights. This workshop starts with a solid introduction to the fundamentals of good painting and strategies for painting outdoors in all kinds of conditions. The workshop includes lectures, hand-outs, demonstrations, personal one-on-one instruction and painting on location in beautiful classic Maine coastal settings including lighthouses, surf, rocky coast, beaches, marshes, harbors and picturesque villages. I will demonstrate my painting technique and students get the opportunity to paint in a fun, high-energy, 5 day class. Students must provide all of their own art supplies, meals and transportation to and from painting sites. To register for these workshops and for an accommodation list please contact me. 2015 MAINE LATE SUMMER WORKSHOP// SEPTEMBER : “CAPTURING THE LIGHT ~ PLEIN AIR IN MAINE ” DATES: SEPTEMBER 14 -18 FOR: EXPERIENCED BEGINNER THRU INTERMEDIATE $300 ~ Class meets from 9am-12pm each day. All levels welcomed ~ beginner to professional. Late Summer in Maine is the best. The days are still warm, the leaves are beginning to turn and the beaches empty. This workshop starts with a solid introduction to the fundamentals of good painting and strategies for painting outdoors in all kinds of conditions. The workshop includes lectures, hand-outs, demonstrations, personal one-on-one instruction and painting on location in beautiful classic Maine coastal settings including lighthouses, surf, rocky coast, beaches, marshes, harbors and picturesque villages. I will demonstrate my painting technique and students get the opportunity to paint in a fun, high-energy, 5 day class. Students must provide all of their own art supplies, meals and transportation to and from painting sites. To register for these workshops and for an accommodation list please contact me. I have a few workshops coming up in some gorgeous places…. 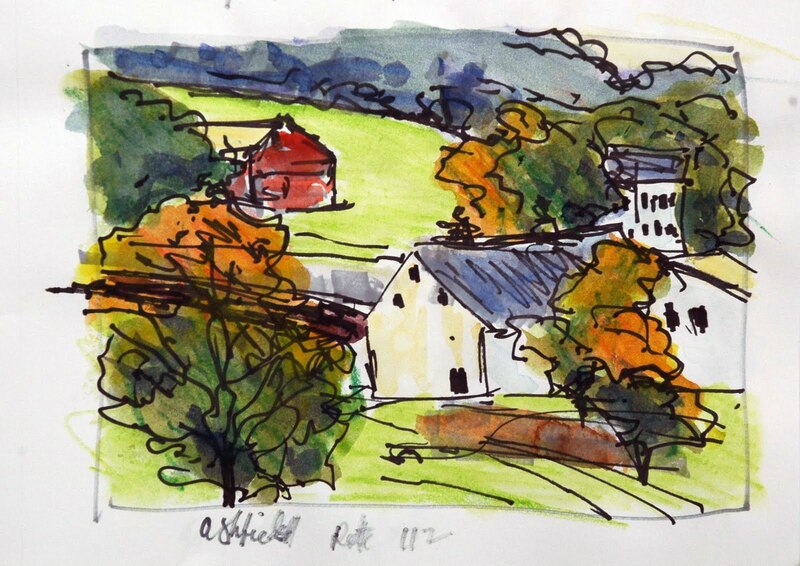 The first one is The Sketchbook Journal – sketching and painting with watercolors in Canterbury Shaker Village, Canterbury, NH. The workshop is May 22nd & 23rd. This workshop is great for all levels. You will get a chance to try a number of techniques. Materials list available. The setting is spectacular with great open meadows, interesting architecture, and big sky action. Come paint some juicy paintings !